Diet soda – the name itself is a bit of an oxymoron because although it’s void of calories it’s been found to actually increase appetite and contribute to weight gain. But if that highly popularized finding wasn’t enough to get you to ditch those diet drinks, then listen up: scientist’s have recently discovered drinking diet soda may increase your risk for cardiovascular disease (CVD) and CVD related mortality. We at myWholeLife want you to be your healthiest self, and we certainly don’t want you to partake in a habit that raises your risk for the #1 cause of death (heart disease). With that in mind, we compiled everything you need to know about the diet soda and cardiovascular disease link; and included pertinent information on other health risks associated with drinking diet soda. And for good balance, we also included 7 delicious and refreshing diet-soda drink alternatives that your whole family will love. The study, which was published in the ‘Journal of General Internal Medicine,’ aimed to evaluate the relationship between diet drink consumption and cardiovascular events. In order to assess the potential connection, researchers compiled data from a national, multicenter Women’s Health Initiative Observational Study (WHI OS) that included almost 60,000 women. The women included in this study were postmenopausal, healthy and had no pre-existing cardiovascular disease at study onset. The researchers compiled data on cardiovascular events such as coronary heart disease, heart failure, myocardial infarction, coronary revascularization procedure, ischemic stroke, peripheral arterial disease and CVD death. Compared to women who didn’t drink diet soda, the women who drank 2 or more diet sodas per day were 30% more likely to have a cardiovascular event and 50% more likely to die from cardiovascular related disease. In fact, 8.5% of study participants who drank 2+ diet sodas daily, experienced cardiovascular events during the investigation. 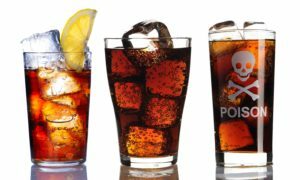 Of those who drank 5-7 diet soda drinks weekly, 6.9% experienced cardiovascular events; and of those who drank 1-4 per week, 6.8% experienced cardiovascular events. Perhaps more disturbing, each drink was defined as a 12-ounce serving (equivalent to a standard size can of coke); but many diet soda drinkers consume fountain pop which can contains upwards of 40-oz, and some even refill those large sodas (which would be the equivalent of consuming 7 servings in just 1 sitting!). This was not the only study linking diet soda to heart disease either. Researchers from the University of Miami and Columbia University conducted a study on 2,500 New Yorkers (aged 40+) and found that the daily diet soda consumers had a significantly higher heart attack and stroke risk over a ten-year period, than the non-diet-soda consumers. Although the exact reason why diet soda increases cardiovascular disease risk has not yet been identified, it appears to be correlated with its effect on your metabolism. According to researchers from both studies, diet drinks are linked to metabolic syndrome, which is not a disease in and of itself, but a cluster of symptoms that increase your risk for cardiovascular events including: high blood sugar, high blood pressure, excess abdominal fat, and unhealthy cholesterol levels. In fact, one study published in the ‘Diabetes Care’ journal found that daily diet soda drinkers have a 36% greater risk of developing metabolic syndrome and a 67% greater risk of developing diabetes than non- diet-soda consumers; both of which vastly increase stroke and heart attack risk. The artificial sweeteners in diet sodas have been found to increase appetite and caloric intake, and contribute to weight gain. A scientific review conducted by the European Food Safety Authority, also found that the sweeteners used in diet sodas can contribute to birth defects, fibromyalgia and a range of serious illnesses, including cancer (particularly lymphoma and leukemia). Diet sodas have also been linked to a multitude of nasty of side-effects including: reduced bone density and increased risk for osteoporosis, a reduction in healthy gut microbes (probiotics), headaches, tremors, dizziness, skin allergies, gastrointestinal distress, heart palpitations, memory loss, aggressive behaviour, ADHD, kidney problems, hangover symptoms, DNA damage (caused by potassium benzoate), and reproductive issues. It should be noted however, many of these side-effects are anecdotal and have not yet been scientifically confirmed. Citrus Water: Squeeze organic lemons, limes and/or orange slices into either plain or carbonated water. Throw in the peel and let the flavors marinate for a couple of hours for added flavor complexity. If you have a sweet tooth, add stevia or xylitol to taste. You can make a delicious sugar-free lemonade with this method too! Virgin Mojitos: Combine muddled mint leaves, lime juice, stevia or xylitol and soda water. Add ice and enjoy. For a sweet and delicious twist, you can add some muddled berries (strawberries, blueberries, raspberries etc.) to the mix. Iced Tea: Brew a large batch of your favourite tea (green, black or herbal). Let it cool in the fridge and drink as is, or add xylitol or stevia and a squeeze of citrus juice for added pep. Hibiscus Orange Delight: Boil dried hibiscus leaves or hibiscus tea bags and add the fresh juice from an orange. Let cool in the fridge and enjoy. Unsweetened Coconut Water: This makes an excellent, healthy and refreshing electrolyte drink and you can find it at pretty much any grocery store. Choose unsweetened though or else you will get an unhealthy serving of sugar with this otherwise healthy beverage. Iced Coffee: Brew organic coffee, let it cool and then add cashew or almond milk, and ice. You can also add vanilla extract, cinnamon, nutmeg and/or stevia to the mix for a decadent treat — shake it all up and serve. Green Smoothie: Throw in a blender a handful of frozen spinach and frozen berries, a couple slices of mango, a few ice cubes, 1/3 cup of cold water and blend. For an extra health kick that will help promote glowing, radiant skin, add a tbsp. of raw apple cider vinegar and a tbsp. of unflavored gelatin. This smoothie is not only delicious, it will also give you a natural energy boost without the shaky effects of caffeine.